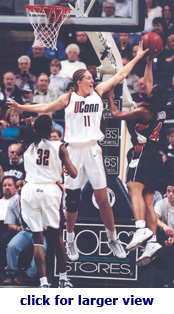 Kelly Schumacher was a Center for the UConn Huskies from 1997 – 2001. She was a key member of the 2000 National Collegiate Athletic Association Championship Team setting an NCAA Final Four record with a career high nine blocked shots during the championship game. Kelly is ranked third all-time in career blocked shots as a Husky. She was selected 14th in the Women’s National Basketball Association Draft to the Indiana Fever in 2001, and is currently a team member of the 2007 WNBA Champion Phoenix Mercury. I had the opportunity to meet Kelly while her team was in CT for a game in June 2007. Born in Cincinnati, Ohio but raised in Quyon, Canada, Kelly loved all sports but didn’t actually have an opportunity to play on a team until around fifth grade for a one-day tournament. It wasn’t until she reached the ninth grade at Pontiac High School that she was able to play on a team with practices and a schedule of games. “We only had nine people on the team. Whoever tried out made the team, and we ended up winning the Provincial Regional Championship.” Kelly really enjoyed her high school team. “There might have been up to three of the nine players that couldn’t make a lay-up but we had enough talent to pull through with a few of us, and we worked pretty well as a team.” Kelly, now at 6’ 5”, was the tallest on her team and most athletic. “I had two of my best friends, one that was really talented in sports, and the other a really quick point guard, that we were each others competition throughout our high school career.” While at Pontiac, Kelly was voted Most Valuable Player in basketball, volleyball and soccer. After Pontiac High School, Kelly went to John Abbott College (a college prep school that is considered high school in Canada) for two years where she enjoyed many accomplishments. “There we had two years of a dream team. Ten of us came in together, and we won back to back National Championships.” Kelly was awarded John Abbott’s Rookie of the Year, John Abbott’s Women’s Athlete of the Year, All-Canada and Women’s Basketball Most Valuable Player Team, and Canadian College Athlete Association Player of the Year. The transition from high school to college was not that difficult for Kelly. While at John Abbott she experienced practices that were similar to UConns. With extra credits from a seven-course workload at John Abbott being applied to her UConn credits, Kelly was able to balance her four-course workload and basketball quite easily. 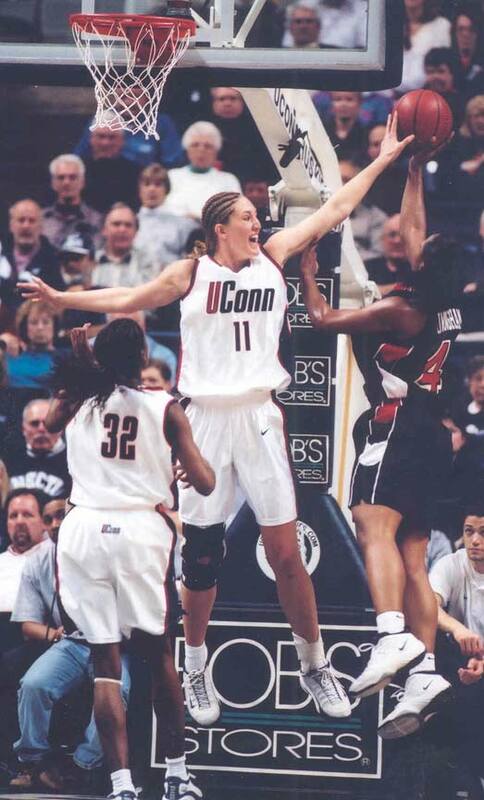 While at UConn Kelly’s most memorable game was the National Championship in 2000. “That was probably the most exciting thing ever, playing in front of 25,000 fans in Philadelphia, and I can probably say I had the best game of my career so far in that game. I keep waiting for a better game but it hasn’t come yet.” During that game Kelly had a career high nine blocked shots setting an NCAA Final Four record. Going to the Final Four as a senior was also memorable but UConn let the game get away from them after being up by 16 points against Notre Dame University. Ironically Kelly’s best friends today are Niele Ivey and Julie Henderson, both former Notre Dame players. “The UConn/Notre Dame rivalry just keeps on going in my life.” Another accomplishment for Kelly while at UConn was leading the team in blocked shots during her sophomore, junior and senior years. Kelly earned her Bachelors Degree in Communications and was off to play in the WNBA as she was selected #14 in the draft to the Indiana Fever. After playing with the Fever for five years—she had appeared in more games than any other Fever player, and was second all-time in career blocked shots for the Fever—Kelly needed a change. She was traded to the New York Liberty in 2006 where she enjoyed the amount of playing time she had but knew she could be happier on another team. Kelly is now in her first year playing for the Phoenix Mercury. “We have a great team. I have a good role, and I’m having a lot of fun.” Phoenix became the 2007 WNBA Champions last week.